Boy Scouts and Girl Guides (a.k.a. Girl Scouts) and knotting are inextricably entwined in the mind of the general public. How many times have knotters been asked if they belonged to those admirable organisations? It is a reasonable assumption and I in turn assume that most knotters would associate Scouts and the Woggle. A quick scan of several of my knotting books, including ones originating from Scout sources, fail to mention the device even in J E Harvey’s “A Comprehensive Text of Turk’s Head Knots”. It is not defined in my Webster’s but I did find a definition in an Oxford dictionary. 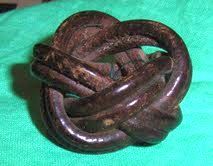 “A loop or ring of leather or cord through which the ends of a Scout’s neckerchief are threaded.” Further research revealed that the Woggle is not always a 4x3 Turks Head. There are a lot of different versions of the device, but the objective of this article is about the original; the one and only Gillwell Woggle, and some of the facts and legends associated with it. WD "Bill" Shankley created this object by request of BP c1920. He called it a "Woggle". Donated to the Scout Heritage Centre by Rolf Shankley, Bill's son, in 2011. The first legend is that the Woggle originated in Hobart, Tasmania. Not true, but what is true is that it does live in the Scout Heritage Museum at The Lea, a few km south of the city. A second legend is that the creator, William Daniel Shankley, made it from the drive belt off his mother’s sewing machine. I am assured by his son, Rolf, that this is untrue. In all likelihood, the iconic piece of leather was originally used for that purpose, but it was long after William had left home. A third legend concerns the alternate use of the thong. It was supposed to be able to be used to make a bow for a fire drill. We all know that Boy Scouts are supposed to be able to start a fire by rubbing two sticks together, and maybe many know about building fire drills, but I have been unable to either debunk or authenticate this particular story. The aforementioned William Shankley was born in 1901 in Islington, London, UK. He left school in 1915 and enlisted in the Army, but was discharged when his true age was established. In 1918 he registered for Sea-Scout coast watching. After the war and a short time as a builder in Monmouthshire, he was offered a position at Gilwell Park, Chingford. It was here that he worked with Baden Powell, being involved with training, the production of the “Gilcraft” instruction books and the “invention” of the Woggle. This replaced, at least in some cases, the “square knot” that was used to tie the scarf. I have heard that it was (1) initially used to identify leaders and/or (2) awarded when the Scouter had achieved a wood craft qualification. It is reported that William Called it a Woggle as it was “a name given to something without a name”. At Gilwell Park, William appears to have further developed his craft skills. In 1922 he accompanied Sir Alfred Pickford, Overseas Scout Commissioner for the Empire, as secretary and to assist with training courses. 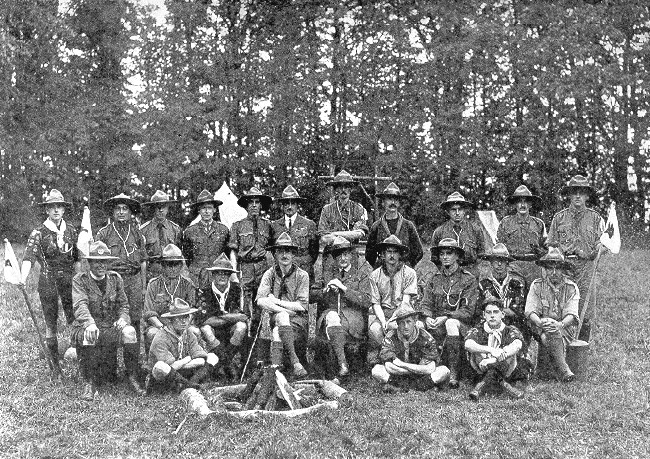 He was involved with Scouting activities in Australia and New Zealand. Rather than return to Britain, he worked in various places in Australia, primarily in West Australia. In 1952 he moved to Tasmania, taking up a position at The Friend’s School. He remained active with the Scouting movement for practically the rest of his life. He was instrumental in setting up a Scout Group at the school where his nick name was “Woolley”. In teaching the lads the Sheep Shank, the knot became known as the “Sheep Shankley”, hence the derivation. William died in 1978. He left behind a wonderful collection of craft work now in the possession of Rolf (his son), who kindly allowed me to handle and photograph some. A couple of years ago, Rolf was persuaded to donate Woggle Mark 1 to the museum for the benefit of all. So that is the brief history behind the Gilwell Woggle and why it sits in a place of honour in an exotic place half way round the world from its origins. Any Guild members that have the good fortune to visit Hobart should visit both Scout Heritage Museum at The Lea and the Maritime Museum which houses one of the best knot boards in the world. I wish to acknowledge the enthusiastic assistance extended to me by Sue Gardiner of the Scout Heritage Museum and Rolf Shankley in the preparation of this article. Frank Brown is an IGKT member who lives in Tasmania. The International Guild of Knot Tyers "Knotting Matters" The Members Magazine by kind permission.